100 Pictures of water garden features. UK prices and locations. These pages are designed to give you lots of different ideas about water garden features which you can have in your garden. Against each picture is a description of the water feature, its approximate price and the website address where it can be bought. There is a wide range of prices and styles shown. All the garden water feature companies in this series of are UK based and will supply in the UK. Each of the links has been tested to ensure that they are to real websites. At the bottom of each GardenAction page are the links to other pages on GardenAction where we have more pictures and descriptions of water features, over 100 in all. Good luck and enjoy browsing. 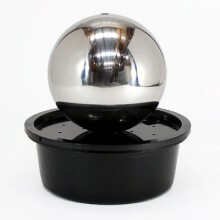 Relax and watch water flowing over this 45cm Stainless Steel water feature. In the evenings this water feature is lit up by LED lights with dramatic effect. It attained the height of popularity by appearing in the Channel Four program Big Brother House. The feature also appeared in the BBC program Digging Deep. Already have a water feature? The solar powered water pump kit can be used to replace existing pump of an old water feature, or to convert to a solar water feature. Environmentally friendly, easy to use & best of all, at no operating costs! 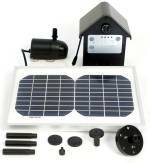 Adding a solar powered pump to your garden pond is the easiest way to get movement and life into the water fountains, water courses and lights in your pond without the need for mains power. Even if there is a power outlet near the pond, solar power is the smart and safe way to go, perfect for those water gardeners wanting a green solution. 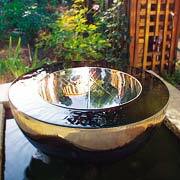 This garden water feature is available at Grange Aquatics, Botley, Southampton. Suppliers website is Grange Aquatics. 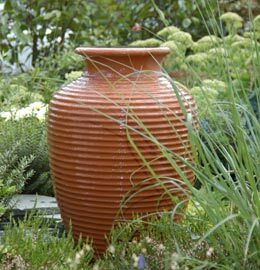 This self-contained water feature is a terracotta urn. Water bubbles over and runs down the sides of the ribbed urn into the reservoir below. The feature includes everything you need. Also included ia an installation DVD, it's easy to fit. Click here to go to the suppliers website. Supplier is David Harber available online. 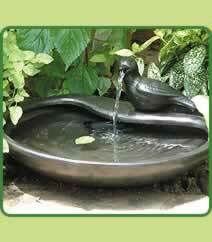 This new style solar powered water garden feature recirculates water (when in direct sunlight) through the dove and into the bowl providing a gentle stream of water that adds a relaxing background sound in the garden. Finished in glazed terracotta with a separate solar panel. 37x33x19cm high. Solar panel is 25x20cm. Weighs 4kg. Click here to view more details on their site. Well we know that art and water features show up in the sunlight but at the evening time is when a lot of times are entertained. So there are other ways that you can light up your yard so that in the evening you can enjoy it as well and that's very important and welcoming people to your yard. One of my favorite types of lighting are these solar power light rocks so they actually look just like a rock and you put it in your garden.